"Gynecological Surgery", founded in 2004, is the first and premier peer-reviewed scientific journal dedicated to all aspects of research, development, and training in gynecological surgery. This field is rapidly changing in response to new developments and innovations in endoscopy, robotics, imaging and other interventional procedures. Gynecological surgery is also expanding and now encompasses all surgical interventions pertaining to women’s health, including oncology, urogynecology and fetal surgery. The Journal publishes Original Research, Reviews, Evidence-based Viewpoints on clinical protocols and procedures, Editorials, Perspectives, Communications and Case Reports. All articles, except Editorials, are subjected to peer-review. Submissions of images and video clips as supplementary files are also encouraged. The Journal further provides a forum for education and discussions on broader issues, such as training in minimally invasive surgical technologies. We therefore consider reports and comments on teaching and training programs in surgery with relevance to women’s health. Manuscripts are subjected to a rigorous but speedy peer-review process, designed to improve submissions by providing authors with constructive comments and feedback. Gynecological Surgery publishes only those articles that meet our quality-control criteria, particularly in terms of originality, validity of research methodology and conclusions, and adequacy of referencing. 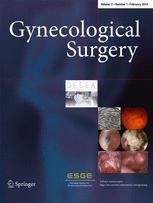 Gynecological Surgery appears quarterly (one volume per year) and publishes all articles "online first" and fully citable prior to the print version. The articles are published after language editing and after final approval of the author.